HATTIEVILLE, Belize District, Mon. 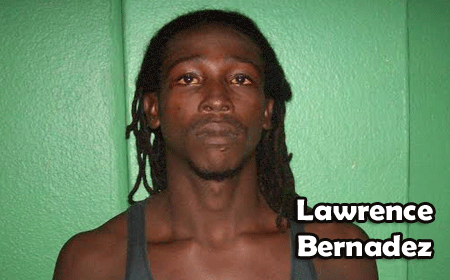 Dec. 7, 2015–Dangerous prisoner Lawrence Bernadez, 28, of Dangriga, remains at large after he escaped from police while he was being taken to the Belize Central Prison to be remanded. Police reported that a team of police officers were transporting three prisoners – Lawrence Bernardez, Eden Guzman and Daniel Mckenzie – to the Belize Central Prison from Dangriga. The three prisoners were put in the open back of a police pickup and handcuffed to each other, and Bernardez was additionally cuffed at the feet. Upon approaching the pedestrian ramp, however, which is about 50 yards from the Hattieville Police Station, two of the three prisoners – Eden Guzman and Lawrence Bernardez – jumped out of the police mobile unit and sprinted away. The officers set chase, but the two prisoners ran into the bushes. Shortly after, the officers found Eden Guzman. He struggled with the police officer, however, and was shot in the leg. Police were not able to capture Bernardez, however. The escaped prisoner is considered dangerous and the public is advised that if Bernardez is seen, they are to call the nearest police station, or 911. Members of the public should not approach him.